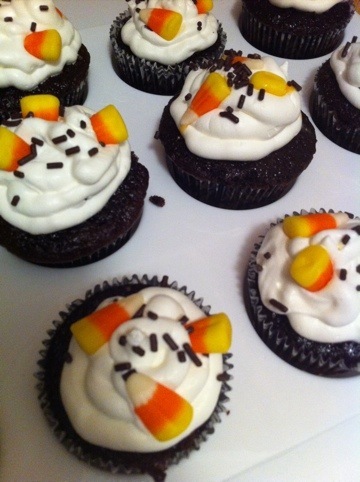 I was so excited to try my own version of cupcakes filled with candy corn filling but found these cute treats quite a trick to make! I loved the idea of having a simple cupcake on the outside but a fun Halloween surprise on the inside! When done correctly, these desserts look like they have a giant candy corn on the inside with white, yellow and orange icing. I have to practice my cutting skills a little more for next time so it is in a better triangle shape, but overall, it was a fun Halloween treat! Thanks Sugar Turntable! love your ideas! !